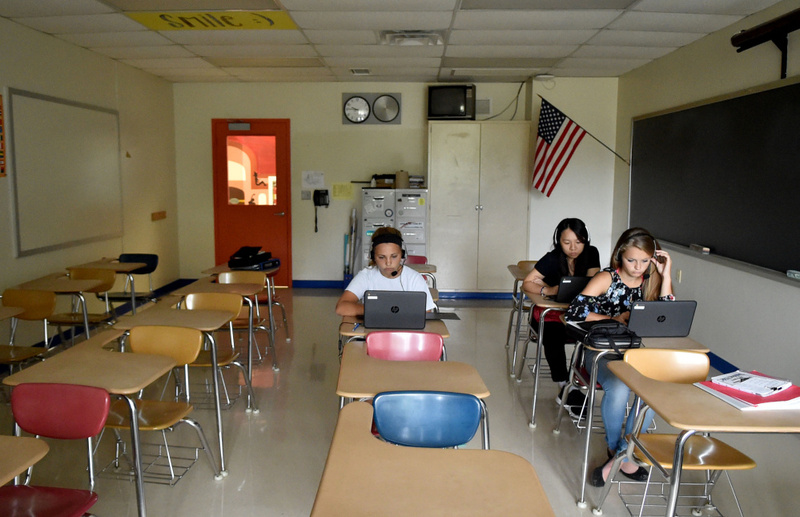 New technology in the classroom is helping schools to continue providing instruction in the absence of teachers, but some educators say it's not a permanent replacement. MADISON — With just a few weeks to go before the start of school this year, Madison Area Memorial High School Principal Jessica Ward faced a dilemma: Classes were about to start, and the school didn’t have a foreign language teacher. She contacted nearby universities and the Department of Education and posted the job online, but no one applied, even as five other open teaching positions were filled. The school district — which has no other foreign language teachers other than at the high school level — had already earmarked money for the position, but with no applicants for the job, the school guidance counselor and superintendent started researching other options, ultimately coming up with a proposal to put the money toward the computer program Rosetta Stone to take the place of a full-time French and Spanish teacher. They also hired an education technician to supervise students and oversee the program’s administration. Madison, a small central Maine town of about 4,800 residents, is not alone in its struggle to attract foreign language teachers. 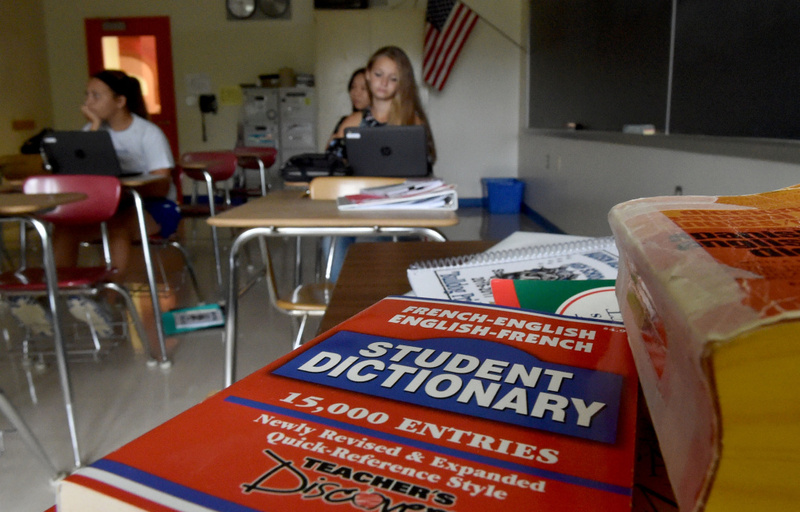 The problem is statewide, but is especially bad in rural school districts, since the shortage allows teachers to be more selective about where they work and live, according to Jay Ketner, world languages specialist at the Maine Department of Education, who said the state has faced a shortage of world language teachers since the mid-1990s. The problem is largely due to a lack of students pursuing degrees in teaching foreign language at colleges and universities, perhaps in part due to the elimination of some teacher training programs in Maine’s public university system, Ketner said. Because there is also a nationwide shortage of foreign language teachers, it is hard to attract teachers from out-of-state. 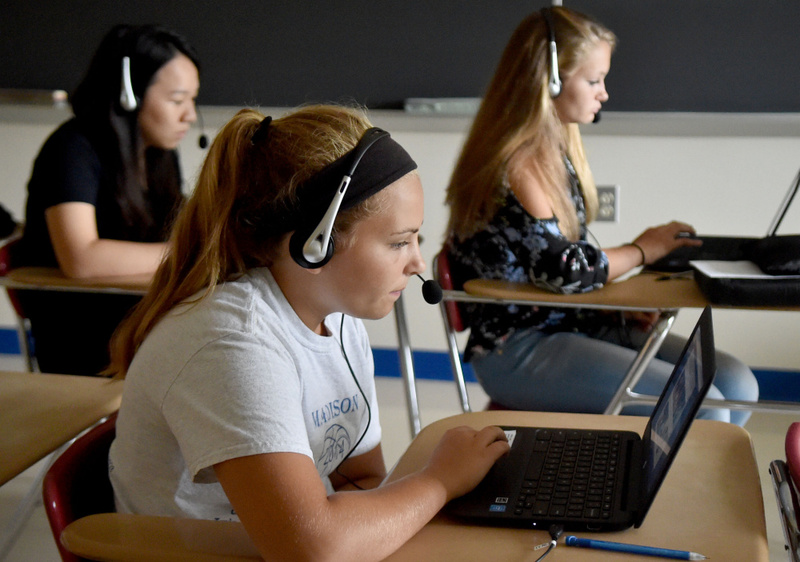 While technology like Rosetta Stone is not a replacement for a live foreign language teacher, some educators say it is a way to allow schools to continue offering foreign language instruction in light of nationwide teacher shortages. There is currently no statewide requirement that students study foreign language. While the state does plan to make foreign language a requirement in its move toward proficiency-based diplomas, they have put off doing so until 2025 due to the shortage, said Debra Plowman, director of policies and programs for the Department of Education. In Madison, 67 out of 215 high school students currently take a foreign language, something that Ward said while optional is usually recommended or required by colleges. In nearby Farmington, Mt. Blue Regional School Unit Superintendent Tom Ward, who is not related to Jessica Ward, said students at Mt. Blue High School are required to take one year of foreign language in order to graduate. “In the last two or three years we’ve had a particularly hard time trying to find French world language teachers,” Tom Ward said. While the high school has a French and Spanish teacher, they have been unable to fill a French teaching position at Mt. Blue Middle School and as a result do not currently offer French. Tom Ward said he thinks a shortage of world language programs at colleges and universities and fewer students studying world languages contributes to the problem. The district also stopped offering German about four years ago because they couldn’t find a German teacher. “It’s a major problem, not just in Maine but nationwide,” Tom Ward said. In Bingham, School Administrative District 13 Superintendent Virginia Rebar also said that recruiting foreign language teachers, in particular those who are certified to teach both French and Spanish, is a problem. 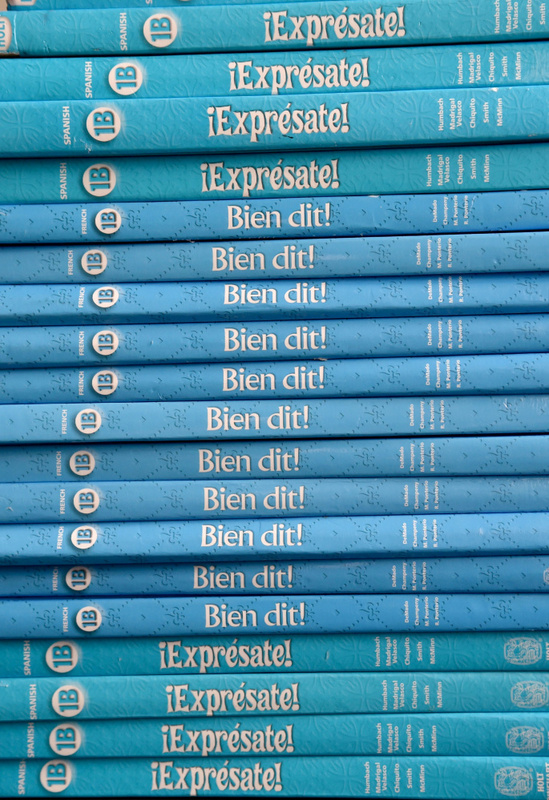 That district has also adopted the Rosetta Stone program for the first time this year for its Spanish students. “It’s difficult, not just finding someone certified in a language but dual-certification so they can teach more than one language, which is often what we look for in a small school,” Rebar said. The Rosetta Stone program, which teaches students through language immersion, is currently used in more than 4,000 schools nationwide and by more than 500,000 students. There is a growing need among schools that are unable to recruit teachers, but ideally the software is used in conjunction with a live teacher, said Franklin Moomaw, a Rosetta Stone regional sales director for education. 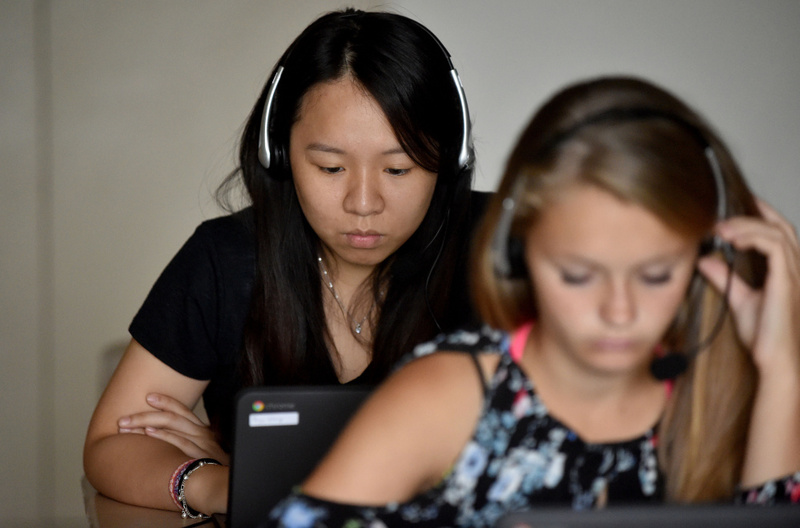 In Madison the program has allowed the high school to expand its language offerings. Instead of just French or Spanish, students can now choose from up to 30 different languages. It also allows for flexibility around different abilities and skill levels with one classroom containing students of different levels all working in different languages. The program uses the idea of language immersion to teach, meaning that students are forced to use the language to learn it, but that also means they can’t always ask specific questions about word meaning and grammar, Moomaw said. That’s where a teacher can be helpful, though there are also things the program can do that teachers can’t. In a traditional classroom, it’s common for some students to feel uncomfortable speaking in front of their peers. The computer eliminates that problem, said Education Technician Nicholas Paradis, who oversees the language classes at Madison high school. Paige Wong, a foreign exchange student from Taiwan and a senior, said she likes the program because it picks up on areas that are challenging for her — listening skills and conversation. The program also allows students to work at their own pace, the only requirement being that they finish one language level by the end of the year. There is no homework, although students can work on the program at home, and the only tests are the ones prompted by the program. There’s also the opportunity to return to a particular lesson if it’s something a student struggles with. That happened recently for freshman Laurie LeBlanc, who was told by the program that she would return to a particular lesson later this month. LeBlanc, 15, said she wasn’t sure what to think of the program, since as a freshman, she has never studied a foreign language in school before. “It doesn’t make a difference to me since I didn’t have a teacher before,” she said. Some students, however, said they liked the additional options provided to them through digital instruction. Aidan O’Donnell, also a freshman, said he decided to take German this year because he has family in Germany and would like to take a trip to visit them. As the world becomes more globalized, the role of foreign languages — and foreign language teachers — is becoming increasingly important, said Jessica Ward and others. Teachers can help students forge a better understanding not just of language, but of the culture it comes with, Moomaw said, and can help them relate what they learn to their lives. In Madison, Ward said the school hopes to hire a foreign language teacher by next year, even if the Rosetta Stone program continues to be successful this year.